Whether you use Google+ knowingly or not, meaning whether or not you actually engage on the destination site, you have to realize that the project has been a complete shift for the entire company as a whole. Even though it has a separate name and a separate URL, you simply cannot turn a blind eye to the fact that the social tools within the project have been weaved into Google’s biggest products. If you call Google+ another “social network”, you are simply missing the point. Now that we have that out of the way, we can move on to the actual innovation that’s happening with Google+, which is quite impressive. Today, the company announced a whole new set of features called “Communities”, which allow you, or anyone, to set up a place that’s not your own profile and not a business “Page” to have discussions on any number of topics. The feature will be rolling out to all users today. If you’ve been a heavy Internet user over the past ten years, you might be familiar with this concept. Yahoo! really nailed it with Yahoo! Groups, as it quickly became the destination to set up a place to discuss your kid’s soccer team, technology, sports, world events and everything in between. The flaw with products like that, including Google’s own “Groups”, is that it’s not integrated with anything else, they were standalone. It meant that you had to stop what you were doing and go somewhere else to interact. That was fine when there was nothing to do on the Internet, but now that we have a multitude of sites and options to keep us busy, that simply doesn’t fly anymore. With Communities, you can create say, a TechCrunch community, and nest a bunch of sub-topics within it. For us, it would be Apple, Google, Microsoft, Social…you get the point. Anyone can then come along and start a discussion within that Community, sharing things from all over the web with the flick of a wrist, just like you would to a circle. The idea is that if you have a video of your cat jumping off of the couch, not everyone in the world wants to see that. Maybe your “Cat Lovers” circle does, and so will your new “Cat Mega Lovers” Google+ Community. Make sense? Again, nothing new here concept-wise, the innovation is in the Google+ integration. By seeing what Google has done with its social project, you can then imagine how Communities could become an integral part of your work flow, search experience and social life. All from anywhere on the web. I had a chance to take Communities for a quick spin while I visited the Googleplex this week. It will pop up on the left-hand side of the destination site, allowing you to create your own or search out others. 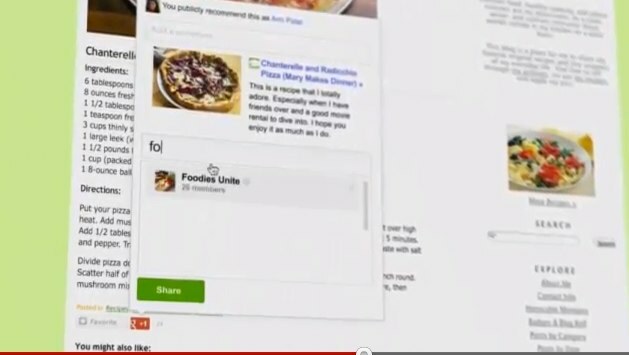 You can of course find ones that interest you within the Google+ unified search experience. As far as options on what types of Communities you can make, that’s simple too: public, public with membership required to interact, private but discoverable, and private but not discoverable or indexed. This could be great for your church group, gamer guild, drone clan or just a place to bring your family together to go wild with sharing things. Since it’s a static “place”, it’s easy to go back through an entire stream within topics without losing your place. It’s really slick. This is the first major release since last Google I/O’s announcement of Events, which are also integrated with Communities, of course. The downside to this release is that it’s not readily available on the Google+ mobile apps, which is a bummer. If I start a Community on Google+, I want to be able to take it with me wherever I go. Of course, you can use the mobile web version of Google+, but the native app is too beautiful and intuitive not to use. Hopefully, the update comes soon. By making Communities, and the rest of Google+, available throughout the web, you’ll often hear Googlers call this approach “Activating the web”, and it is to a degree. You can now share this article to a Community and a Google+ circle, including your mom, using our +1 button. Even she’ll understand how it works.